Like a star in the darkness of night, Benedict of Nursia brilliantly shines, a glory not only to Italy but of the whole Church. Saint Benedict: lived from 480-547A.D. We do know he is the twin brother of St. Scholastica, Abbess of Plumbariola, and Foundress of the "sister" Order of Benedictines. There are a bazillion other saints hailing from the Benedictine Order! St. Benedict's iconography often shows him, with an abbot's staff and a raven, since it was a raven that brought him his daily bread while he lived as a hermit in the desert. Jealous monks one (at least) tried to poison St. Benedict's wine, but at the sign of the cross over the goblet, it shattered, saving the abbot from the poison. This is the meaning of the snake within the goblet. Known for his gift of prophesy, St. Benedict is also shown with a closed book, indicating the mystery of his knowlege. * Order your own copy of the original Rule of St. Benedict. * Since St. Benedict is the patron of beekeepers, you could read up today on bees and bee keeping this day. 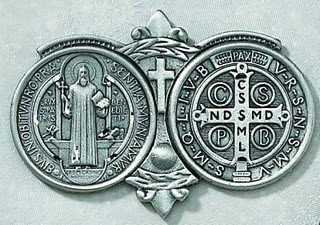 * Learn about the medal of St. Benedict.